AMACOM/American Management Association, 9780814416136, 440pp. Terrorist attacks. Data assaults. Natural catastrophes. Disease outbreaks. Recent years have taught us that not only was 9/11 not just a single, horrible occurrence, but that events of many types can--and statistically will--hit organizations of every size, threatening to disrupt and potentially even destroy those that are not fully prepared. 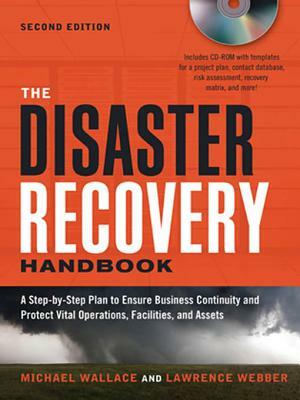 This revised edition, filled with up-to-the-minute thinking and the latest legal and technological updates, provides readers with practical tools and ready-to-use instructions for assessing risk; clearly documenting recovery procedures; assembling a disaster team; testing and debugging every step; protecting material resources; and recovering vital records. In addition to a CD packed with forms and checklists, the book contains case studies, interviews, and all the practical guidance needed to create the kind of thorough disaster recovery plan every responsible organization must have in place. MICHAEL WALLACE is VP of Application Engineering at Result Data, an IT strategy, business intelligence, and disaster recovery consulting firm. He is a member of the Contingency Planners of Ohio and the Project Management Institute. LAWRENCE WEBBER is a Certified Project Manager (CPM), a Master Business Continuity Professional (MBCP), and Director of Programs and Processes for System Design Advantage.